The current discussion concerning broadband access to public safety mobile units has been active and ongoing for years. The primary reason for discussion regarding this issue is the fact that current dedicated digital authority networks cannot provide the data capacity required for modern applications. However, capacity limitation seems to be the last point that discussion participants can agree on. The question of how to bring the broadband to these vehicles has multiple opposing viewpoints and conflicts of opinion. The first and the most obvious answer to bringing broadband into public safety vehicles is to build dedicated networks for authorities. The main problem with this solution is the huge cost involved, along with limited available frequencies. The second solution is to use a commercial provider with special deals to offer the data capacity required. Here the main concern is the availability of the data and resilience of the network. 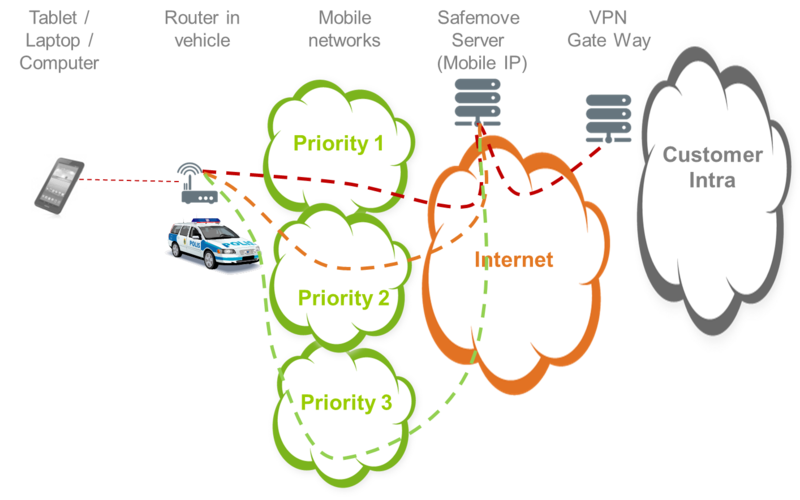 The third option includes several hybrid solutions, either combining dedicated and commercial networks or using multiple commercial ones. The key problems with this latest solution are perceived to be resilience and availability. Participants in this discussion are however too often lead astray by either their own personal experiences on how networks function, by operator promises regarding availabilities, or dedicated network equipment providers’ denigration of commercial networks. The only way to know with certainty the availability of any single network or selected networks together, is to test them in real life environments with the same applications used by the authorities. This document shows the results of several selected pilots or tests conducted in Europe and the USA. The number was limited for presentation purposes, but very similar or even identical results have been seen from tens of tests around the world. Each vehicle was equipped with a Multi-Channel Router (MCR) with selected available main operators in each case. A laptop or a tablet was attached to the router. The router created a Mobile IP tunnel to a server in the cloud and from there the connection to authorities’ back-end systems was created. We wanted to test against the clarified customer claims. The first claim was that one network operator is enough within cities. The second was that out in remote regions there is no coverage at all. We first present the results from using the hybrid network approach within selected cities. The cities included here are Brussels, Antwerp and Los Angeles. The test duration for each of these tests is several hours - long enough to give a clear picture of real life operation of the networks within the given cities. As is clear from the example, the network availabilities of individual network operators are far from the 100% claimed. Over just a few hours there may be more than 50 data interruptions. It is similarly clear that multiple networks overlap favourably. The joint coverage with just two operators is always close to 99.5% and often close to 99.9%. What is also important is that the bundled solution practically removed all longer breaks that would have caused the user to feel an interruption to the service. Looking at the GPS data in heat maps gives a clear visual representation of the fact that the networks are full of holes when it comes to delivering broadband to moving vehicles, even in densely populated cities. For remote location testing we selected a third network to ensure we get the maximum coverage. Only in Iceland did we use two networks due to fewer available operators without network sharing. We always try to select networks that have as little coverage overlap as possible. The locations tested include are some of the most remote in Europe, including Ireland, Norway and Iceland. The results were surprising. It is understandable that single network availabilities are significantly lower than in the cities. But surprisingly they still are very seldom as low as 80%. The number of service interruptions increases with lower availability and it was noted that some of the breaks extended from tens of second to minutes and even tens of minutes when driving. Despite much lower individual network availability in these areas, the bundled uptime results were excellent. Over 99% is an excellent figure considering the places where these test routes were driven. Places so sparsely populated that there are often no inhabitants within a radius of tens of kilometers. Even in these remote locations, the bundled solution offered uninterrupted connectivity as any longer breaks in data were reduced to zero. The user did not experience any interruptions to the service, even when some short breaks in the data stream occurred. Availability heat maps show clearly how multiple networks combine to provide the high availability encountered. Anecdotal evidence and personal opinions are especially misleading in this area without accurate data regarding mobile broadband data coverage. Typically individual opinions have been influenced by personal experiences and are further confused by operators marketing messages. The discussion around the need for dedicated broadband networks is manufactured to some degree by the equipment providers themselves. Opinions that are not backed up by real data and test based findings should not form the basis of decisions made in this area. In every test made, several parallel networks have been proven to provide greater resilience than a single one. Tests conducted in various locations across the US and Europe prove two crucial points. The first is that no city can provide sufficient broadband availability for public safety vehicles over a single network. The second is that even the most remote areas can provide availability that is acceptable for public safety mobile broadband. It is worth noting that similar tests are always needed in a new region in order to form valid conclusions. Of the tens of tests conducted so far, all have yielded very similar results regardless of locations. Hello, thank you, it's interesting. What is the net throughput you have received per vehicle? How do overcome the issue of network shut down in emergencies (such as suicide bomber) sue to network overload - especially where the Police, EMS and Fire need the connectivity? Last question: throughput in cellular is not guaranteed as it is subject to the number of users in the cell and to the proximity to the BTS - how do you provide SLA in these terms? First: The troughput varies. We got anything from edge in very remote locations to LTE speeds of over 10 Mbit/s in the best locations. In many cases the continuous connectivity is more important than huge capacity. In some instances the connection was lost also for short periods of time, but the user didn't notice it. Second: Yes we tested with demanding online applications like webex and also video. Our approach of proactively selecting always the best network seems to be the right way to handle this. Bonding various networks creates too much latency and other problems when in these extremely dynamic environments. Third: How to deal with congestion? This is a million dollar question. What we've seen is that sometimes the router solution that keeps all the networks "active" reserves capacity from the networks and functions despite other users have problems. But sometimes the networks crash. Then the question is. what is the alternative? Use satellite (we support this) or build a dedicated network in the area rapidly. But also P25 and Tetra get congested and the officers still need to be able to operate. Don't hesitate in investing into broadband connectivity only because there are rare occasions when it might not work. Fourth: I partly answered with congestion to this. One can prioritize traffic classes or port level in our solutions. It is also possible to do by the operators already in 3G, but it is never implemented. LTE will provide better possibilities for this. Prioritization will remain the question between the users and the network operators. So. Good questions. I have the feeling that the best thing to do is to start with these type of solutions that are cost efficient, but maybe not perfect. Using broadband will help us to find the actual killer applications and eventually we'll also learn about the anticipated problem situations, too. These systems have been in use in Finland already for 3 years and implemented nation wide. The users are still extremely happy despite occasional limitations. From your detailed answers I gather these systems can work nicely for non-mission-critical applications that require the bandwidth but not really need the SLA (minimum bandwidth for mobile applications such as Video/VoIP regardless to other users in the cell) nor to operate in emergencies (such as one that impacts the cellular networks operation). BTW, some companies claim that networks aggregation works well but I am not in the details to understand the impact on latency. And last, In case there is a need for true private wireless broadband network which is immune against cellular network interferences or shut down, it is required to use a sub 6GHz wireless network that supports mobility. It requires Capex obviously...but the turn out would be SLA, high bandwidth and full control. The system is used also in mission critical applications and traffic can be prioritized to some point. It's used in thousands of public safety vehicles continuously in various applications. It's often a question of "define mission critical", because no one can count 100% on having data connectivity with any system. Also tetra and P25 have big congestion problems at larger events. Aggregation has big challenges with mobile applications, since the networks behave so dynamic. And aggregation usually provides N times the lowest available bandwidth. As an example: if one network falls to Egde, you get N X edge. Despite that you might have one of the networks at LTE (10 + M). You loose one of the connections when driving around all the time that means that you needs to re-establish the aggregated connection all the time. Doesn't work well, in my opinion. My message is that it's surprising how good, resilient and high availability data connectivity you can get by using the commercial networks smartly. The seamless switch over to always the best networks is a great and beneficial feature. No one should wait for the dedicated networks to start with the implementation. As the dedicated networks emerge, one can easily upgrade the routers with the suitable network card. Is the multichannel approach 100%? No. Is it good enough for 99.99% of time? Yes I think so. Can it improve the efficiency of pour public safety servants? Definitely a lot.